It isn’t unusual for Sterling Systems & Controls to be called in to fix problems with equipment systems of other brands. One major snack food producer did just that. 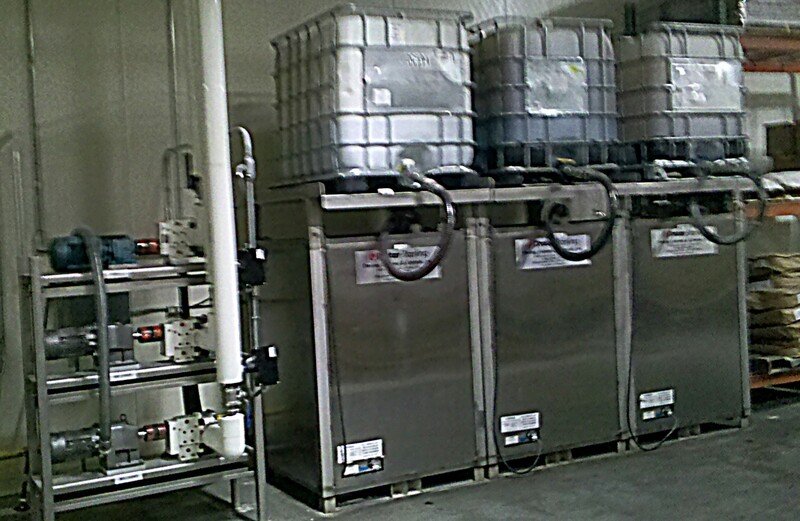 It was a sizeable project as several dry ingredient systems and liquid additive systems needed retrofitting. Sterling engineered new automation and process controls to replace the competitive panels and systems. Sterling’s recommendations were accepted by the customer almost verbatim. ly tote on top that feeds the mother tote when required. The pumping system is on a rack located next to the totes, and the Coriolis type Flowmeters, scale hopper and mixers are further downstream. Inner Bottle-poly bottle with food grade ‘Micro-Pore’ super smooth inside finish. Full Tube and Transfer Hose– -60” x 2” Clear PVC food grade hi-flex liquid transfer hose with stainless steel couplings. Tote System with “Mother Tote” and Supply Tote. Inter-Stack Stand– a 10” stand gives sufficient clearance for the transfer hose, lid access and the remote elevated vent. Valve.-2” full port ball valve with 2” Cam Lock dust cap. Heater-New design 1200 watt, Thermal Cell-all 304 stainless steel. Electrical – Standard 110-120 volts “plug in” 15 amp integral heater and thermostat. Heater plug-in will be at the rear of the tote. Thermostat and Thermowell temperature controlled. Adjustable thermostat setting for temperature control at 110°F. Lid.-Standard 7” threaded lid with automatic vacuum vent. 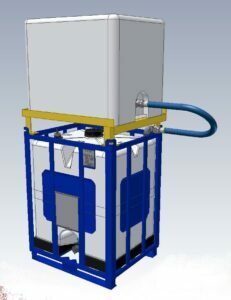 Frame– Full enclosure all 304L stainless steel, polystyrene high density R-5 insulation all four sides. Sight area and calibration label open to view for inventory management. All welds clean and wire buffed. 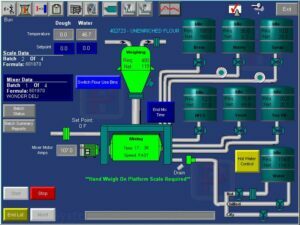 The process control and automation of the three (3) liquid dosing tote system is integrated into one of several new control panels supplied by Sterling Systems on this upgrade project. While not shown here, this screen shot shows the main processgraphic screen. 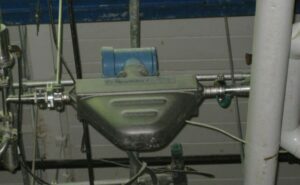 The liquid dosing tote systems can be controlled to specific metered amounts or the fluids can be weighed by scale hoppers and pumped to the mixers.